I like to let the kids know what’s going on in the news, just so they know, and so I can attempt to give them what I believe to be both (hopefully all) sides of the story. 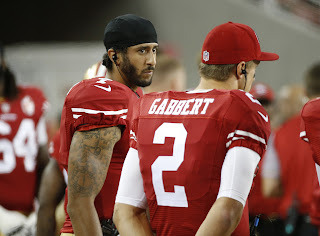 I explained that Colin Kaepernick was refusing to stand during the National Anthem because he was “not going to stand up to show pride in a flag for a country that oppresses black people and people of color.” When he could not really explain why he might feel that way I went on to tell him that white police officers had shot and killed many unarmed black people (mostly black men) recently (or perhaps always and just recently it’s news!?). Many Police Departments lacked transparency, and many attempted to cover up what had happened, how it happened, and what they were (or were not) doing about it. And it seemed that they believed a slap on the wrist was a just consequence for killing an unarmed black man. It also seemed that even the Police Departments that did investigate wanted to prosecute the officers much more leniently than many believe they would if the person killed had been white. I explained that Police Officers have very stressful jobs, and that putting themselves in danger every day, for relatively very little pay, is what they signed up for. Getting killed while at work is a regular thing for those who enforce the law. So… I don’t feel that it is normally OK to second guess the split second decisions of the people who put themselves in very dangerous situations, since we are not willing to put ourselves in those positions. I have never worked a job as stressful as being a Police Officer, and I still don’t like my actions to be second-guessed all of the time. And with that said, I do believe that the people we trust to do that job should be held to a higher standard that the rest of us. While we know they are only people and that they will make mistakes just like the rest of us, their mistakes also carry much higher consequences that our mistakes. Our country, The United States of America, is anything but united. Over the years people have always protested what the people in Washington were doing. People have always thought our politicians were in the pockets of big business. There have always been very rich, some in the middle (pretty well off), and then the rest of us. We have lots of reasons for divisions and splitting into groups to hate on another group. Some people have always felt that they were being treated differently that the rest, and many times this was true. However, I am having a hard time seeing how using the National Anthem as a weapon or tool can have anything but a negative outcome. We already have so many reasons to be divided against ourselves. Racial divisions seem to built into our society (perhaps humans?). Our country is so large that important issues in one area can mean almost nothing in another. Our educational system is absolutely broken and not only do the poor suffer for it throughout their entire lives but it also creates divisions between educated and uneducated. The rise of the internet and this connected world has greatly reduced our face to face interactions, and enabled us to anonymously say whatever we want, as if it were fact. Wall street (greed in general) brought us the worst economic downturn since the great depression. Billions of dollars were made by the already rich, it is clear that some people were purposeful in their actions and knew the downside to what they were doing, and yet not one person was held accountable. The very rich made out like (literal) bandits while everyone else in the country paid the price, and our government (also rich) stood by and watched (and profited). What do we have that brings us together? That unites us? Other than our National Pride? In the past century the issues that divide us were tempered by the larger issues that brought us together… united us as a people. WWI, WWII and the bombing of Pearl Harbor united every citizen behind one cause, and everyone, no matter the color or religion, or socioeconomic status joined together to fight. The problem we are facing today is that for the last 50 years we have had nothing big happen to bring us together (not that I’m wishing for a big problem to pop up). The Korean War and the war in Vietnam were not widely supported, and while many thought we should be helping in Korea that was a long time ago… and not many thought we should have been in Vietnam. It was a disaster and more divisive than anything else. 9.11 brought us together for a short while, and then we find that apparently we invaded Iraq for no good reason. Our president our government lied to us about who was responsible and why we were sending our young men and women overseas. So that failed to actually unite us. What brings us ALL together? As far as I can see… nothing but National pride. Which leads us back to protesting the National Anthem. I believe that we ALL can and should be proud of the strength and actions of our parents and grandparents in building this country, fighting together against those who would threaten us, and working to give us a better life than they had. And… what exactly can we be proud of lately? Today? Anything? We can agree that something has to be done about the seeming ease with which many in law enforcement are willing to point their weapons at black men, and then pull the trigger when the black man is not holding a weapon of his own. And if we don’t believe that violent protest is the answer, then what is left? What can one person, who might has some exposure to the media as his only asset do to make a strong statement. He can use his media exposure to show his unhappiness with the way we as a people, our Police Departments, and our governments have reacted to the recent spate of shootings of unarmed black men by the Police. So… part of me hates the use of our National Anthem as a protest tool. And, I also understand why many find this to be a reasonable recourse. Something has to give, and since I don’t like to think about where continuing on our current path will lead us, this kind of protest has to be OK.
And just how does this all fit on Leaderisticality.com? Well… I believe that Colin Kaepernick is showing extraordinary Leadership around this whole issue. It is a simple yet powerful protest. He is not using it for personal gain or glory. He is not on a whirlwind tour of the news outlets/TV shows. He is not asking for others to join in. He is showing a lot of class throughout.